I made a cement lamb sculpture this week, to go with my little farmer. It’s made out of Quikwall, which you can usually get at Lowes or Home Depot (but not in some places – I have no idea why). Quikwall is a fiber-reinforced mortar that’s called a surface bonding cement, and I’ve seen a number of people use it for garden sculptures. This is the same stuff that Julie used on her mountain lion and other outdoor sculptures, in fact. I used a wire armature, much like the ones used in my book about making the little dogs, but I used very heavy wire that I bought at the local farm store. 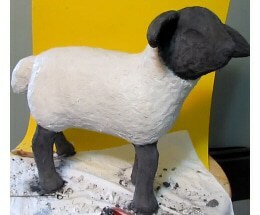 I think if I made this lamb out of paper mache clay instead of cement I’d use a cardboard pattern instead of the wire, just because it’s easier on a sculpture this size. It would be possible, I suppose, to use cardboard inside a cement sculpture, too, if all of the paper was covered with plastic tape so it wouldn’t absorb water when the cement was added. I haven’t tried it, so that’s just a guess. The process I’m using isn’t condoned by the ferrocement experts, so be sure to read up on how it’s really “supposed” to be done if you want to make a cement sculpture that’s guaranteed to last forever. In this case, I’m happy if the little lamb lasts for a few years, and I can’t see any reason why he won’t. Even though I enjoyed the simplicity of this design, I’m now rather tempted to go back and make a a detailed sculpture of a newborn lamb, the ones that are all legs and look so adorable. If I did that, I’d use the cement recipes that I used for the rock person. The fibers in the Quikwall make it difficult to get fine details, but that made it perfect for the lamb I made this week. Hi Livia. I’m glad you’re enjoying the blog. This is utterly fabulous. Every year my husband and I learn a new craft skill together and I bet he would love to try this one next year. I have bookmarked it just to remind me. 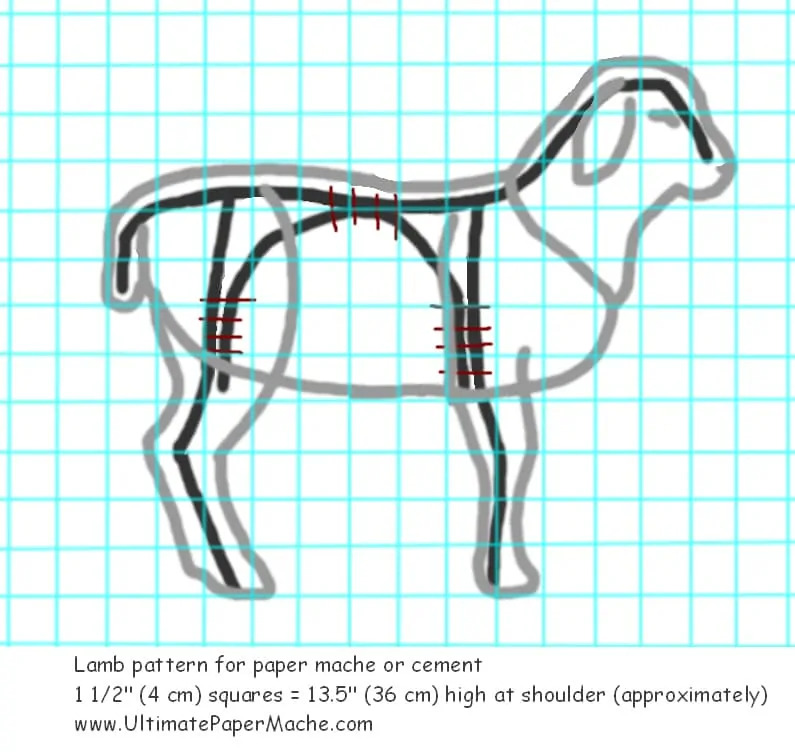 I was looking for some tips to make life size sheep for a Christmas play and came across your lovely site. Wonderful and inspiring work, although I’m not an artist, more handy/crafty than anything. Going to give it a try and will share the pics if my endeavor amounts to anything. Thank you! I can’t wait to see your sheep! I hope you have a lot of fun making them. I am just starting the life size sculpture of the first husky dog. The armature is done, cementing starts tomorrow – when I take the waterproofing liquid back and change it for latex. The joy of living in a country where I don’t speak the language and can’t find half the products I need! My question is, I have just been looking at photos of dog sculptures that have been cast from a mould and I can see they have all been made on an attached plinth. Do you think standing animals made from cement have strong enough limbs to be free standing? I have used old metal broomsticks wrapped in chicken wire to make the inside of the legs and the spine. I can’t get quick wall so I am making my own mix from white portland cement, sand, latex with water and my secret ingredient – husky dog hair! (I have done a test without the latex and its lovely stuff to work with.) There will only be about half an inch of cement around the stick in places, although the paw at the bottom will be much thicker. I don’t want to risk it breaking when it’s finished, but I prefer the idea of it being free standing. Hi Rachel. I’ve only just started experimenting with cement, so you will probably want to get some advice from someone who has more experience. I do know that the best book I found that explains armatures and reinforcing is Sculpting with Cement by Lynn Olson. 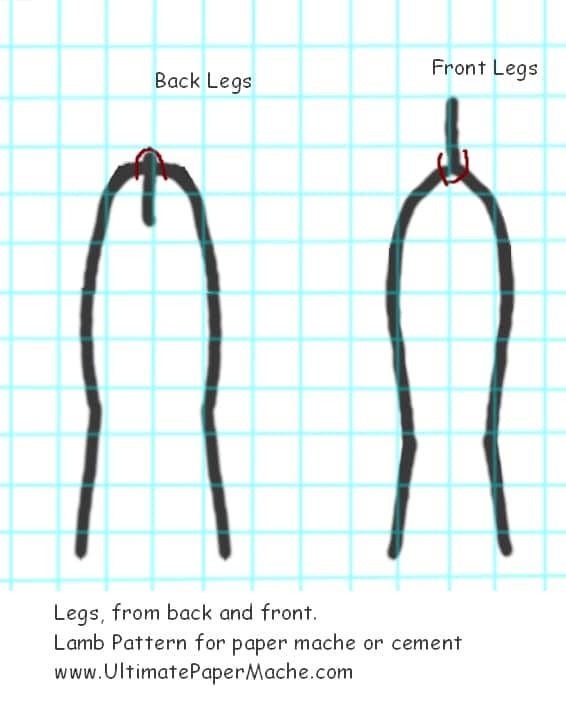 The explanations in the book about why wires and rods need to be placed in particular places really make sense. 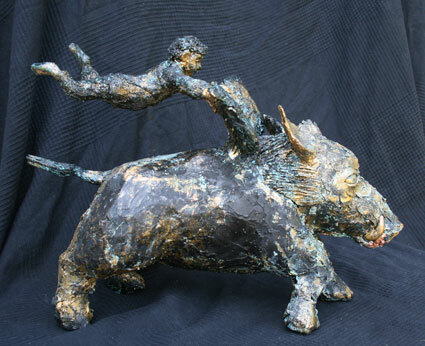 Lynn did use a base on the one four-legged sculpture I remember in the book. It was a giraffe, and she said that the sideways forces from bumping into it or the wind would be too strong without the base, which held the bottom of the legs in place. The book is out of print, so you can “look inside” on amazon.com. But maybe you could get a copy at your library? In any case, be sure to let us see how your husky turns out. I would love to see it. I love your sculpture, Rikke, and the finish that’s on it now is very interesting. As I said before, though, I’m not sure what company might be making the bronze finish and selling in Europe. I hope you find what you’re looking for. I am decorating for a holiday church banquet and I want to use some old reindeer that I used to use outside for Christmas. I have removed the light strands and just have the frame left. I was thinking I could just use paper mache to cover the metal base. Would that work ok and would the flour and water recipe work? Do you have any other ideas for me? Hi Laurie. Yes, you can use the reindeer frame with paper mache. If you want to round it out you might need to add some chicken wire so you have something to stick the paper mache on. Or use crumpled paper and masking tape to fill out the forms. Do you intend to use the finished sculpture inside or outside? Ultimately I would like to use it outside. I really don’t recommend using paper mache outside for any extended length of time. However, some people have been able to keep their creations outside for holiday decorations, by using several coats of spar (marine) varnish over the paper mache. The sculptures then need to be brought inside and dried out completely, and stored in a dry environment. If cared for this way, they may last for several years. Thank you very much for all your advice. I wish I could just clone you and bring you to my house. Thank you again. Hi Sandy. If the pieces broke when you picked them up, it doesn’t sound like they’ve been fired yet. You could find out for sure by putting one of the broken pieces in water. If it softens, you have raw clay, which can’t be hardened without firing. Many local art centers and even senior centers have kilns that people can use to fire their work – you might be able to find one nearby. If there’s a potter or ceramic supply store, you could also ask them for advice – I’m not familiar with clay or ceramics, so I’m really not the one to ask about the pieces that have already been made. A ceramic store would be the best place for advice, because they sell the molds and often they have classes that customers can take, and they’ll fire their customer’s work. If you have a place like that locally, give them a call and see if they can help. Even if the pieces were fired once, if they’re that delicate they would need to be fired again. Ceramic pieces should not break that easily. If your local ceramic store could get a look at one of the pieces, they could tell you right away what you’ve got, and how to finish them. There is a paper-based product that can be used in plaster molds that doesn’t’ require a kiln. It works just like ceramic slip, but it doesn’t need to be fired. It can’t be used for dinnerware or a vase, or anything that might get wet for long periods of time, because it’s a pourable, moldable form of paper mache – it’s called Li Qua Che, and it’s really fun to work with, but it isn’t cheap, for sure. I’m not sure if this was helpful or not – but I do hope you can find a way to finish those lovely things that you’ve inherited from your neighbor. Of course it’s probably more helpful if you were trying to build something extremely large! Thanks! That would make enlarging patterns so much easier! Jonni, I love your sheep. 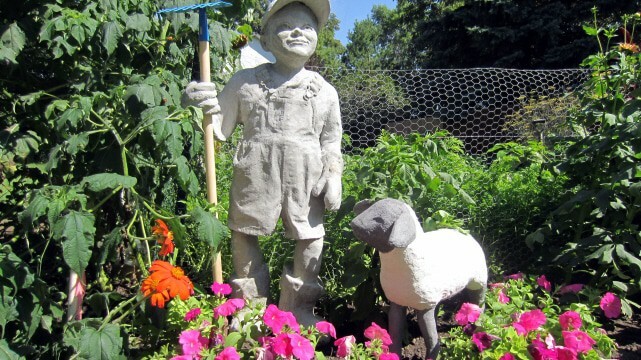 He makes a wonderful addition to your garden and companion for the boy. Thanks for sharing this with everybody. I am trying to make a dinosaur. I have until September 10th to get it finished, so I’m a little stressed. However, I used bubble wrap for the insides, and I was surprised how well that worked. I gave all the heavy paper I had to a friend, so I was desperate. I love the sheep. I have one in paper mache and is finished off with varathane. Do you think I could cover it with the cement product you used? Then I could put him in the garden area. What do you think. I tried to send a picture last time, but I didn’t know how to make it smaller for your site. Thanks for all your fun projects and teaching us how to do this creative art. Hi Jeannette. If you don’t have a program that will make images smaller, you can use this free online tool. I’d love to see your sheep, so please try again. As for covering your sheep with the Quikwall, that would be a question for Julie. She’s done quite a few sculptures that way. She had problems with one of her projects because the legs weren’t strong enough to support the weight of the cement, but she was able to fix it. You may have trouble getting the cement to stick to the Verathane, but you could add a layer of aluminum grid or chicken wire to give the cement something to hold on to – but I’m not the expert in this. Like I said, I’ve never done it.